Minnesota Vikings quarterback Case Keenum earned the game ball after throwing for a career-high 369 yards and three touchdowns in Week 3. EDEN PRAIRIE, Minn. — Case Keenum kept, of course, the game ball he was given by coach Mike Zimmer for his brilliant performance in leading the Minnesota Vikings to victory. He didn’t have a special place for it at home, yet. There’s another opponent coming up, leaving little time for revelry or reflection. “It’s hard for me to talk about it right now because I’ve already moved on,” Keenum said, when asked about the career-high 369 yards and three touchdowns he passed for last weekend to beat Tampa Bay Buccaneers 34-17 . “We’ve got another team coming in that deserves all our attention,” he said. That would be the Detroit Lions, who were inches and seconds from beating reigning NFC champion Atlanta Falcons and remaining undefeated. The likelihood of Keenum starting a third straight game Sunday increased when Sam Bradford was held out of practice Wednesday to rest his sore left knee. That’s an important day for working on the game plan. When Bradford first complained of pain two weeks ago, he took part in practice on a limited basis and went through pregame warmups in Pittsburgh on Sept. 17 before being ruled out shortly before kickoff. The Vikings lost to the Steelers 26-9. In the lead-up to the last game, Bradford was concerned enough about the lack of progress that he traveled for a second opinion from the specialist who performed the two anterior cruciate ligament reconstructions on his knee. Zimmer ruled out Bradford on Friday, giving offensive coordinator Pat Shurmur more time to put in a game plan more tailored to Keenum’s strengths. The advance notice, Keenum said, was nice. But not necessary for success. “It’s just kind of like an `oh by the way’ type deal,” Keenum said. Such is the job requirement for a backup quarterback. “It’s the same thing this week: I’m preparing like I’m going to start, and that’s my mindset,” Keenum said. 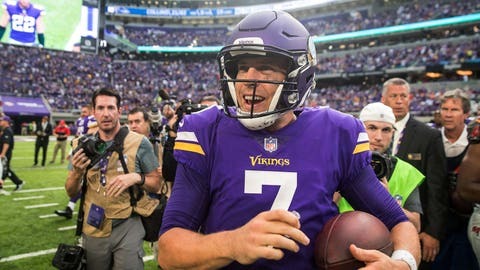 Zimmer said Bradford will remain the starter as soon as he’s deemed healthy again, but Keenum’s performance certainly gave the Vikings more faith they can win behind either quarterback. Keenum finished his college career at Houston as the NCAA’s career passing leader with 19,217 yards and 155 touchdowns, but he was not drafted and had to work his way up through the practice squads of the Houston Texans and St. Louis Rams while seeing sporadic action as an injury replacement. Last year, with the Rams in Los Angeles, he beat out rookie Jared Goff for the starting job and was picked as a team captain until the reins of the offense were turned over to the first overall pick in the draft at midseason. Keenum now has 26 career starts and some rather ordinary statistics on his resume, but he has played on some struggling teams on which he never quite found his footing.